Photo courtesy Utah athletics: Senior three-time All-American Grayson Murphy finished eighth overall at the 2017 NCAA Cross Country Championships three weeks ago, the highest finish in program history. Her own journey isn’t what fuels Grayson Murphy, but it does put those hundreds upon hundreds of miles into perspective. Every time the senior and now three-time All-America runner laces them up, she can’t help but look back. All the tough decisions she made during her three collegiate stops got her here, a spot she admitted she never imagined being. She soon will graduate from Utah as a decorated All-America talent who ran her first cross-country race just three years ago after transferring from Sweet Briar College in Virginia to Santa Clara in the Bay Area. Murphy took up running at Santa Clara after playing soccer at Sweet Briar. She’d never even seen a cross country race before, so her Santa Clara teammates had to explain the ins-and-outs of racing to her in the car on the way to the race in San Francisco. Hit fast-forward, and Murphy finished eighth overall in the 2017 NCAA cross country championships Nov. 18 in Louisville, Ky. It was the highest finish ever (19:36.27) by a Utah XC runner among the nation’s best. 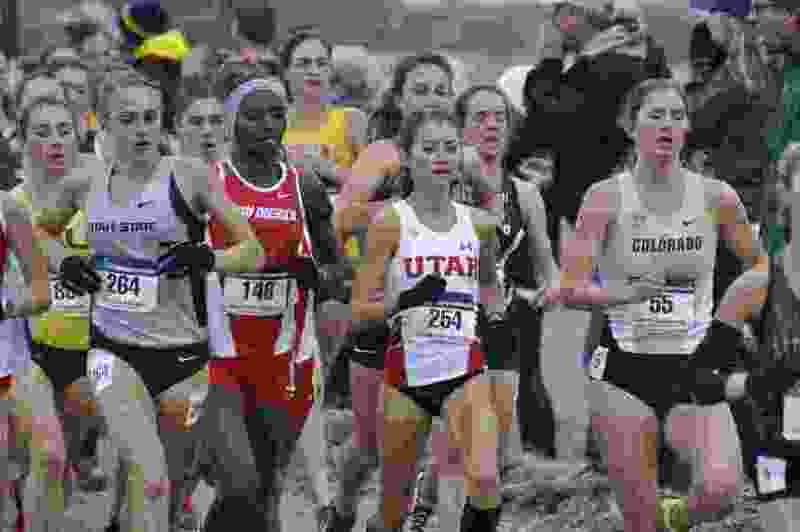 She is now the fourth All-America XC runner at Utah. The West High alumna, who transferred to Utah in 2016, wanted another All-America designation — a top-40 finish — in her final cross country race. That was the first part of her checklist. It was a breeze. Utah’s previous program best at national championships was 14th overall. So as Murphy darted over the course that day, she kept those benchmarks on her mind. She kept thinking, “13th, and see what happens.” Finally, she wanted the top 10, and she got there. There is no down time during the holiday season either. Murphy once again set a school record in the track and field season opening event Saturday in Boston by running a 15:44.45 in the 5,000 meters. She topped her own record and improved that personal-best time by 9 seconds. “She did exactly what we asked her to do and ran an incredibly even race,” Utah coach Kyle Kepler said. Murphy’s roll in her final year of college has her considering running full time as a pro once she graduates. The civil engineering major who carries a 3.9 GPA isn’t allowed to talk to pro coaches or agents due to NCAA rules. Once she graduates, she expects to go down that road with guidance from Kepler and the Utah coaching staff. “I have full faith in them that they can get me to where I need to go,” she said. She plans on sticking around after life as a college athlete, too. Training at altitude is a plus, she said, and has aided in her rise in the sport. The average mileage per week adds up to about 65 miles. Not every day is the same, but she estimates she runs roughly eight miles a day. Her favorite local run is the Pipeline Trail up Millcreek Canyon. Murphy is out to enjoy the last few months as a Ute with track season in swing. But she won’t allow herself to avoid looking back every once in a while. Dominant on the course • Three-time all-American in cross country and track and field. ... Her eighth-place finish at 2017 NCAA Cross Country Championships was the highest finish in program history. ... Two-time All-Pac-12 cross country runner. ... Recently broke her own record in the 5,000 in the track and field opener in Boston last week.